Screwjack pedestal system for support of external raised paving, decking or internal raised floors. Enables drainage without visible grilles. Allows access throughout to concealed services. Load (maximum each pedestal): 1000 kg. Specific recommended maximum load varies with pedestal height, pitch of substrate, symmetry of loading and internal or external application. Slope corrector fitted to top of pedestal, adjustable in half-degree increments. Suitable for pitched substrates (maximum): 5 %. Choice of pedestal material. Resistant to weather, UV, chemical products. Electrically non-conductive. Not susceptible to galvanic corrosion. Choice of spacer tabs suitable for joint width of topping material. As support of the visible bottom surface of water features over service voids. Industrial floors. Not suitable for support of vibrating machinery. Conforms to French standard DTU.43.1 for water resistance of flat roofs and inclined roofs with a masonry structural member in a lowland climate. Base, couplers and head are threaded for assembly and height adjustment. Secured by safety clips. Releasable by insertion of pointed object. May be supplemented by 1 or 2 mm rubber shims. By rotation of slope corrector. Secured by insertion of pin. Diameter 200 mm. Includes external flange with four 4 mm holes and four 8 mm holes for fixings to substrate. Female with internal threading. Lower part male with external trading. Upper part female with internal threading. Diameter 155 mm. Includes hole for insertion of spacer tabs. Clip into hole in Head. Spacer size determines joint width in decking. Special spacers available - consult Buzon. Decking planks screw fixed to joists. Joists located by joist support plates and secured by screw fixing through side flanges. Joist support plates located by proprietary plugs and pin clips. Fixed height (nominal) 26 mm; adjustable angle. Fixed height (nominal) 37 mm; adjustable angle. Adjustable height (nominal) 25–36 mm. With PH5 slope corrector - adjustable height (nominal) 34–45mm; adjustable angle. Adjustable height (nominal) 44–57 mm; adjustable angle. Adjustable height (nominal) 55–79 mm; adjustable angle. With integrated PH5 slope corrector, adjustable height (nominal) 78–108 mm; adjustable angle. With integrated PH5 slope corrector, adjustable height (nominal) 100–175 mm; adjustable angle. With integrated PH5 slope corrector and C2 coupler (x1), adjustable height (nominal) 175–285 mm; adjustable angle. With integrated PH5 slope corrector and C5 coupler (x1), adjustable height (nominal) 285–400 mm; adjustable angle. With integrated PH5 slope corrector and C2 coupler (x1) and C5 coupler (x1), adjustable height (nominal) 355–515 mm; adjustable angle. With integrated PH5 slope corrector and C5 couplers (x2), adjustable height (nominal) 465–625 mm; adjustable angle. With integrated PH5 slope corrector and C2 coupler (x1) and C5 couplers (x2), adjustable height (nominal) 545–750 mm; adjustable angle. With integrated PH5 slope corrector and C5 couplers (x3), adjustable height (nominal) 645–850 mm; adjustable angle. With integrated PH5 slope corrector and C2 coupler (x1) and C5 couplers (x3), adjustable height (nominal) 720–960 mm; adjustable angle. With integrated PH5 slope corrector and C5 couplers (x4), adjustable height (nominal) 830–1070 mm; adjustable angle. Self extinguishing. 20% talc loaded. NB All tabs are 25 mm unless otherwise stated. Nonstandard option. Requires level topping installed to fine tolerances. 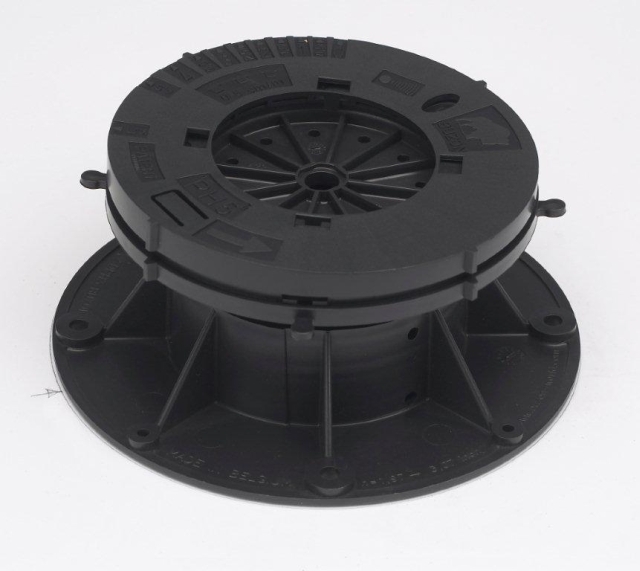 Large pedestal base allows direct placement on waterproof membrane.